Christmas is a time to gather with family to celebrate the birth of Jesus. But for many of us, gathering with family is more than just a celebration. It is also an opportunity for evangelization — which comes with a particular set of challenges. 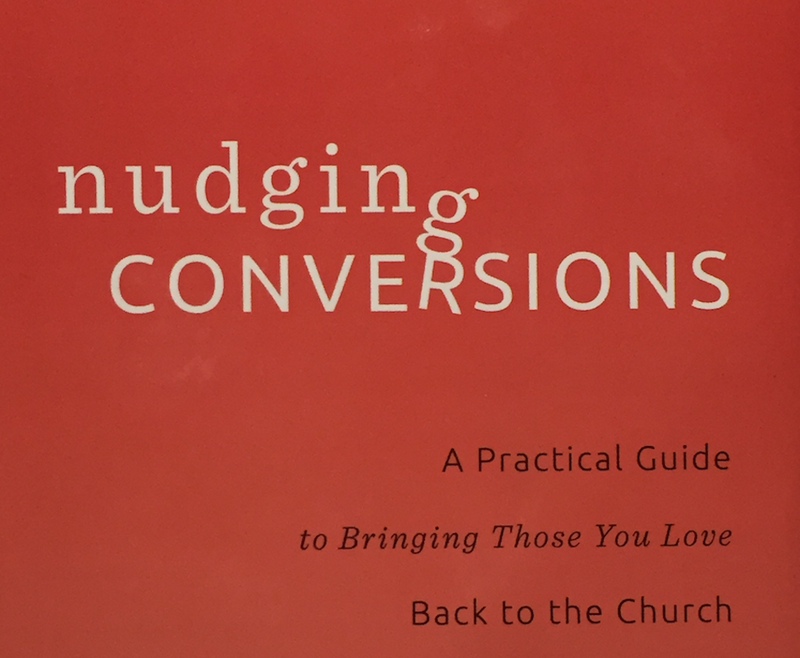 Carrie Gress considers this struggle in Nudging Conversions: A Practical Guide to Bringing Those You Love Back to the Church. ZENIT asked Gress for some tips for the holiday season. ZENIT: With Christmas fast approaching, many of us are thinking about how to share our faith with those we love in a way that will be fruitful, not divisive. What would you suggest? Gress: Christmas can be so challenging for many reasons, but especially when those we love share the holiday with us but not the reason for it. There can be a lot of pressure to find the right thing to say or do in hopes that our faith will rub off on them. Many of us, when we think of evangelization, think of it in terms of a debate: “What can I say that will win them over?” The reality is, however, that most of the time conversions don’t take place because someone is won over with argumentation. While no two conversion stories are exactly alike, the most effective transformations happened when people felt they were loved and not judged. With my own family, I remember trying to win them over with discussions and rather than helping, it just seemed to drive them further away. I think they sensed my own frustration that my efforts weren’t working. In prayer, the idea came to me to give them back to God and just love them exactly where they were in life. I didn’t have to endorse every element of their lives, but just love them as they were. What happened was that our relationships became richer, fuller, and more genuine. Trust was established and they knew that I really loved them and treasured them for who they were. Rather than feeling pressure that “I’ll love you if…” they knew I already loved them. Only then did small changes start taking place. Of course, I was also praying and fasting for them so that grace was moving in their lives. Nagging, passive-aggressive responses and snide remarks simply don’t work. We are called to mimic God’s love of graciousness and generosity. Any expectations we may have of how a soul will move in grace will only hinder the process. ZENIT: You mention in your book that working on our own faith can be effective in helping others come back to the Church. Explain this. Gress: There are actually many reasons. The first is that, in order to pass along the faith, we first must have it. You cannot give what you don’t have. Looking at the lives of the saints, we see that their holiness is attractive, not off-putting. People just wanted to be around them because it made them feel closer to God. The more we grow in our own faith, the more attractive we will be come (no matter what our appearance). Additionally, Pope Francis has given us a great example to follow with his “culture of encounter.” Our Pope is truly present to whomever he is with at the moment. His entire attention is centered upon that person, who they are and what they need. This is another fruit of holiness – the forgetting of self and extension of charity to others. And finally, when we grow in holiness, our ability to hear the Holy Spirit increases. Sometimes he may tell us of particular things to pray for, such as a loved one’s unhealed wound or something they may need. I first experienced this with my sister. I had the sense that, since I was her younger sister, I wasn’t going to be the right person to bring her back to the faith – so I felt the Holy Spirit urge me to pray that she would meet someone else. Sure enough, in the most unlikely set of circumstances, she met a lovely woman who helped bring her home to the Church. ZENIT: Many people think of apologetics as the best way to convince others of the truth of the faith, but you don't put it at the top of your list of effective approaches to evangelize. Why not? Gress: I remember as a young student thinking that I was going to win over a good friend because I finally understood St. Thomas Aquinas’ five proofs for God’s existence. I couldn’t have been more mistaken. Not only was my friend not convinced, she didn’t have any interest whatsoever in the question. Not that she wasn’t bright, but it just wasn’t part of her experience to think philosophically about God. Apologetics are certainly important, especially for certain individuals who have a more intellectual bent or deeper theological understanding, but for most of us there are more effective ways. Hospitality is one of those areas. When we have people in our homes, do they feel welcomed? Are we attentive to who they are, their work, their interests? Do they leave our homes feeling drained and empty or edified with a better sense of feeling “known” by us? It is little things like this that can open a heart to Christ. ZENIT: You have a whole chapter on asking questions in your book. How can questions be helpful? Gress: Questions are an age-old tool. Most people think of Socrates when they think of questions, but Jesus used questions all the time. Think about the Gospels. “Who do people say that I am?” (Mk 8:27), “Who touched me?” (Lk 8:45) or “Can any of you by worrying add a moment to your lifespan?” (Lk 12:25). Although they are used in all four Gospels, Matthew’s account has Jesus asking a question in nearly every chapter. We think of the parables as Jesus’ most common teaching tool, but questions might actually be more common. Why? Because questions help us to realize things in a more profound way than if someone tells us. So what do questions do? First, they take the attention off of you and put it on the other person. Even if they don’t answer the question very thoughtfully at the time, they may come back to it later and rethink what they said. Sometimes it takes hearing our thoughts out loud to realize that they don’t make very sense. Additionally, some times people just need to be listened to. There are a lot of wounded people out there harboring very difficult things. Giving them an opportunity to talk about what they are struggling with can go a long way. ZENIT: In what ways do you see technology helping and/or hindering our efforts? Gress: There’s a great picture on Facebook circulating of about 8 people sitting on couches, presumably at a family event, with everyone of them staring at their smartphones. Smartphones and computers in general have filled up a lot of space that used to be spent talking and just being together. This can certainly be an obstacle. It is hard to find the truth when we get caught up in the quick and fleeting gratification of the next big thing trending online. This certainly has negative effects on our attention spans, but it also makes it hard to think about deeper realities – such as, what happens when we die, why do people suffer, what does it mean to love someone. On the other hand, Catholics in general are doing a good job of filling the Internet with a lot of solid info. When I first reverted back to the Church, the Internet was a new thing. Books and VHS videos were the best options for learning about the faith, but it was hard to know what was worthwhile. The Internet offers a lot of great content without having to wade through heterodox or misleading information. It is important to establish – in all of our lives – tech free zones, like the dinner table. Even something like going for a walk, visiting a museum or watching a fire can offer great opportunities to really talk and think about deeper things. ZENIT: If you could have people remember just one thing over the holidays about evangelization, what would it be?